PlayHall is a decentralized multi-cryptocurrency platform for skill gaming mobile games focused on highly intellectual players who strive for victory. This platform will give players the opportunity to test their skills in PvP matches, participate in global tournaments, and custom tournaments created by players. For the gaming platform currency, there will be seven of the world’s most popular cryptocurrencies, namely Bitcoin (BTC), Ethereum (ETH), Liteсoin (LTC), Ethereum Classic (ETC), Dash (Dash), ZCash (ZEC), Bitcoin Cash (BCH) as well as PlayHall Token (PHT). In other words, PlayHall is a platform based on player competitions, aimed at demonstrating skills such as intellectual abilities, reaction and attentiveness. It also allows players to win cryptocurrency. In accordance with the PlayHall project concept, targeted territorie of the project are the Asia Pacific region, the USA, and European countries. In most cases, skill gaming games are not normally referred to as eSport. Still, skillbased games are directly connected to cybersport, or eSport, since there is a competitive component (PvP) in both categories. One of the most popular examples is the Hearthstone card game, whose income reached about 400 million USD in 2016, with the number of players exceeding 70 million. The rapid development of the skill gaming industry is evident from the growing number of players. In 2017, the global eSport audience is expected to have reached 385 million, comprising of 191 million e-gamers and 194 million viewers. It is expected that by 2020, the latter number will increase by another 50%, to 286 million people. 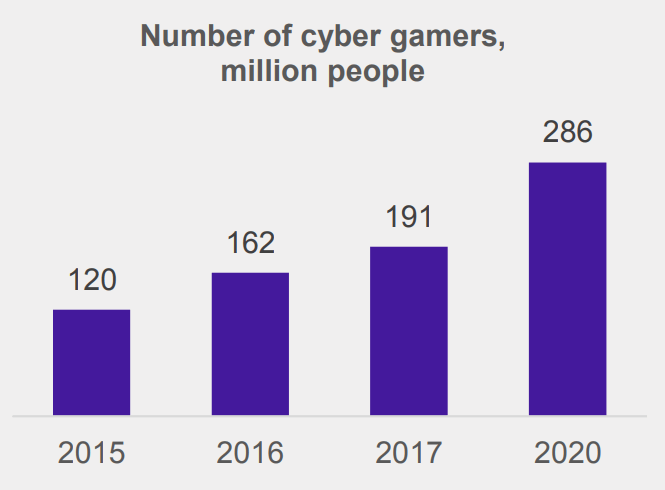 There is no doubt that the growing number of e-gamers and e-game viewers will result in the growth of the skill gaming audience. Traditional board games, along with the sport tournaments, are being steadily taken over by the new e-games industry, and skill gaming in particular. It allows professional gamers to implement their intellectual abilities and skills in competing in popular games, with the possibility of winning real money and/or valuable prizes. At the same time, it is important to note that skill gaming is viewed positively from the perspective of international legal, social and commercial practices. The key advantage of skill gaming is that it is free from the social stigmatization, or public condemnation, that are inherent in casino games or sports betting, which is why skill gaming is potentially capable of attracting a wider audience. The growing popularity of console games is another trend that can be capitalized upon by the gaming industry. Technologies are developing rapidly. Due to the development of blockchain technology, as well as decentralized systems and platforms, customary server solutions used in online skill gaming are becoming obsolete. With the use of blockchain, decentralization and smart-contracts technologies, to organize games, skill gaming has been taken to a new level, which we call Smart Gaming. 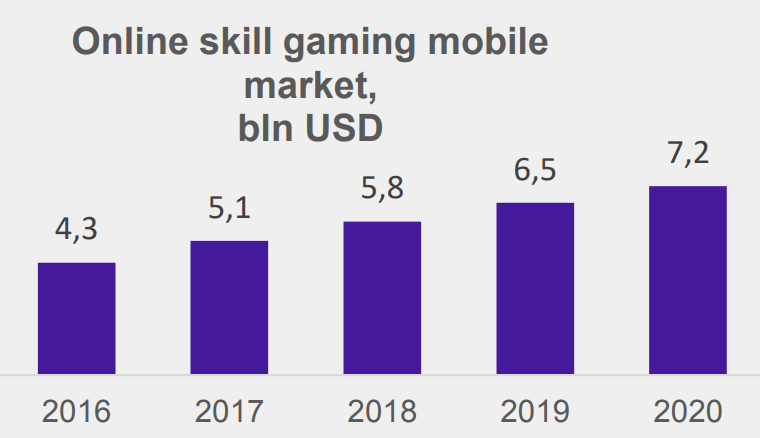 According to the experts, the share of the Skill Gaming segment in the total volume of mobile gaming is about 10%, which in the cost expression for 2017 is about 5.1 billion USD. Meanwhile, by 2020, the total volume of the Skill Gaming market will be about 7 billion USD. Thus, for instance, Skill Games in the US enjoy widespread popularity and as of the year 2016 lead in the number of mobile game downloads as well as in the MAU (Monthly Active Users) figures, reflecting the monthly audience of active gamers. Existing online skill gaming platforms have adequate liquidity in terms of the number of players. They are also at relatively low risk compared to traditional sports betting, which explains the constantly increasing number of such websites. It should be noted that most of the online skill gaming websites are only present in local markets, and target their local audience, which means that the PlayHall platform will have the opportunity to enter free markets, satisfy the demand and scale up at a fairly rapid rate. Major distinguishing characteristics of gambling and skill gaming, as well as their similar features, are reflected in the table below. Currently, the skill gaming online industry has not been developed to its full potential. It is normally represented either by software development companies, or by separate platforms/websites focused either entirely on skill gaming, or which have added skill gaming to their portfolio, along with existing games, including gambling games. Perhaps, the most vivid example of skill gaming is Skillz, the fastest growing company in the United States, according to the 2017 Inc. 5000 rating. In 2016, Skillz’s revenue was 54.2 million USD. The Skillz startup has generated impressive results in less than 2.5 years. In the first quarter of 2017, 3 million players joined Skillz. Back in May 2017, the San Francisco company announced that its revenue run-rate had doubled in the previous eight months to more than $100 million. Nevertheless, despite the doubtless advantages of the trend of interest, certain flaws do exist. A key issue is the high difficulty for a player to receive his or her winnings: participants can spend real money on buying ammunition, totems, etc. facilitating the attributes’ victory, however when attempting to exchange their winnings in game currency for real valuables, certain difficulties arise. Winners use various methods and exchange channels to get real valuables for their winnings (special services and auctions, forums, “grey exchanges”, by way of direct agreements between players) and, as a result, just 4% of them manage to successful receive their honestly won money. On top of that, often times, players are subject to blocked accounts on the part of the developers, which leads to a loss of the game currency they won. For instance, while on the Skillz platform, players receive winnings immediately in the form of prizes, the amount of which is also limited by the offers of the internal store, meanwhile players of the PlayHall platform after winning a match and a tournament immediately receive a prize fund in the popular cryptocurrency and/or tokens PHT. Thus, the PlayHall team offers liquidating the risks of issues arising with the receipt of their actual winnings and offers a way to legally and easily earn cryptocurrency and the PlayHall tokens represent real value. The initial PlayHall team is created. Visit to the ICE Totally Gaming conference in London, where the initial vision of the Skill Gaming platform was conceived. The vision of the PlayHall Skill Gaming platform is conceived along with the creation of its initial technical task and a marketing plan. Agreements concluded on porting of the first PvP games. Beta version of the platform developed with the first ported games users can play for demo-tokens. Accreditation of 20 games, which are to be further developed by third-party developers, so as to remain connected to the platform. Preparation for Token Pre-Sale and Token Sale. 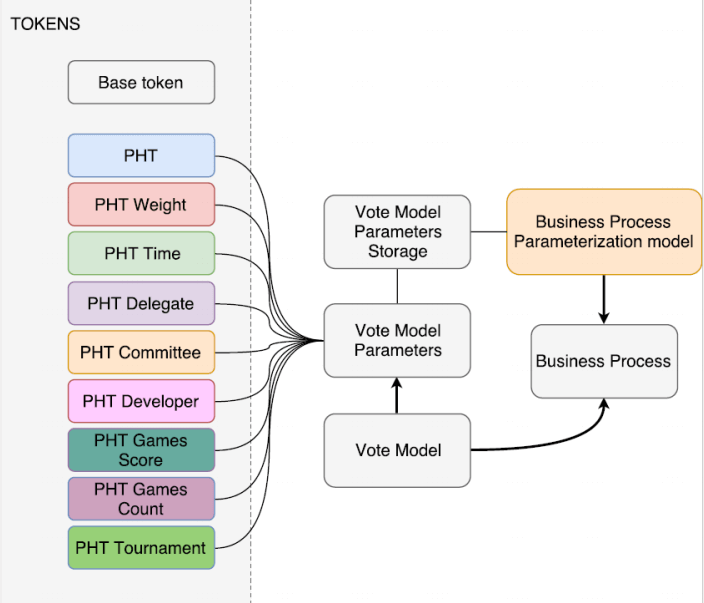 Adaptation of PlayHall.com platform to the targeted markets, introduction of cryptocurrencies and PHT usage as the game currency of platform. Launch of the first 20 games of the platform with the possibility of playing with cryptocurrency and PHT tokens. PlayHall platform offers about 50 games. PlayHall platform offers about 200 games.